Treat yourself to a walking – and eating – tour through one of Taipei’s oldest districts. These days the old name of Bangka (also referred to variously as Mangka, Mongka, Monga and Mengjia) has made a comeback, and is emerging from an image focused on snake blood and a red-light district to take on one dominated by historic lanes, old temples, and the vibrant youth culture of the Ximending area. The bulk of the things to see and taste in Wanhua are near the MRT stops at Ximen (the “West Gate” of the old walled city) and the venerable Longshan Temple. We begin our tour at Ximen, and gradually walk southwest toward the Longshan area, providing affordable food and drink suggestions along the way. Inside the Ximen MRT Station is a helpful Visitor Information Center, where you can obtain a free map of Bangka. To help the reader navigate, we’ve also provided our own maps on these pages. Zhongshan Hall (中山堂); 98 YanPing South Road (延平南路98號), near Exit 5 of the Ximen MRT station. The building sits just outside of Bangka’s limits, but is definitely worth including in a trip to the district. It’s a little difficult to find these days, though, as it’s surrounded by larger buildings. As you come out of Exit 5, go straight in the lane between the Taipei Chinese Orchestra building and the PartyWorld building. 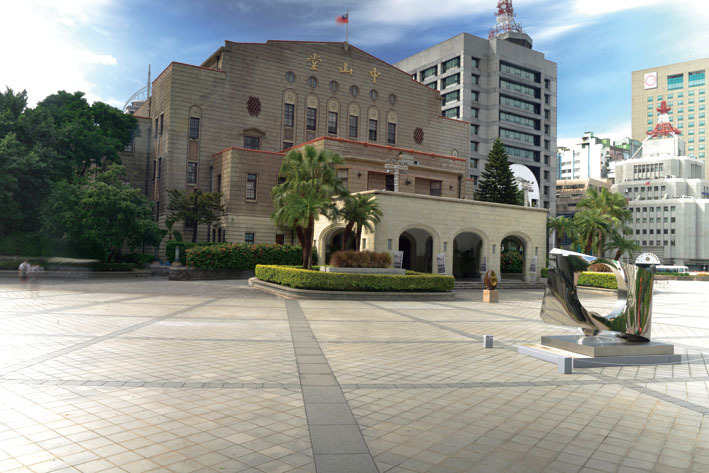 You will soon spot Zhongshan Hall (named after the honorific for Sun Yat-sen), its courtyard, and a variety of statues. Completed in 1936 during the Japanese colonial era, the Hall was once one of the most famous structures in Taipei, and after significant effort, it has now been reborn. The green tiling on the upper portions of the Hall, and the scoring of these tiles, was designed to make the building less visible to enemy bombers. In 1945, the Hall was where Chiang Kai-shek’s emissary accepted the surrender of the Japanese forces on behalf of the Allies, and in 1954 it was the site of the signing of the U.S.-Taiwan Mutual Defense Treaty. In that period it was used as the seat of the National Assembly and for receptions honoring visiting foreign dignitaries. These days, it is an active venue for musical performances, lectures, and exhibits. 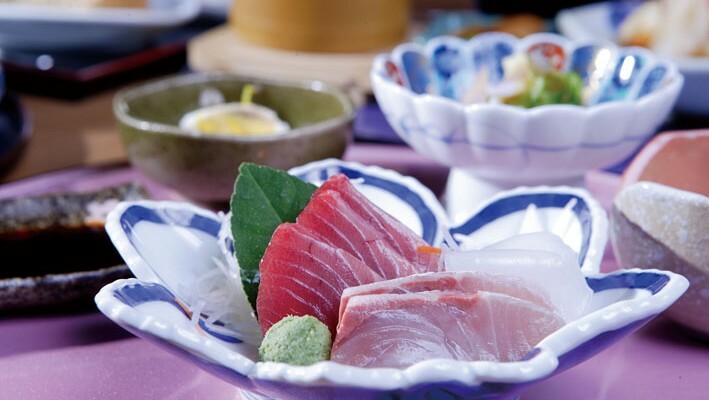 From a wine and dine perspective, the two main highlights are a Japanese teahouse and a coffee shop. It also has a Western-style restaurant. The Tea House (茶坊); ZhongShan Hall, 3rd Floor. This Zen-infused teahouse contains many display cases related to tea, giving it the feel of a museum. The atmosphere, including pleasant Asian music in the background, makes it an excellent place to relax on your own or chat with friends. The Tea House winds through a significant portion of the third floor. The minimum charge per person to enjoy tea and snacks in one of the interior rooms is NT$350, or NT$250 per person at one of the tables in the external area. We ordered a very nice Wenshan Baozhong (文山包種) tea from Pinglin. The staff helped us along, pointing out the finer elements of preparing and drinking tea. We supplemented the tea with a tangy side order of lemony kumquats (檸檬金桔). 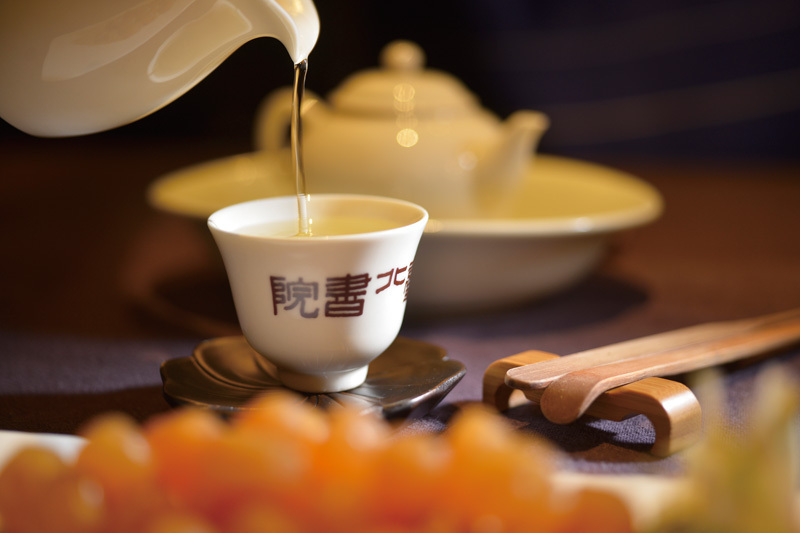 The shop offers teas from many regions of Taiwan, as well as other places. Le Promenoir Coffee (迴廊); ZhongShan Hall, 4th Floor. This charming coffee shop, marked by marvelous sights and smells, was relaunched in September 2015 with a new name and ownership. Previously it was known as Director Tsai’s Café Galerie. Customers are welcomed by lighted siphons steaming away. From the selection of coffees from all over the world, we ordered and enjoyed the Kenyan coffee. From one table, you can look down YanPing South Road and see the North Gate (Beimen) in the distance. While pleasant jazz music can usually be heard in the background, a piano in front testifies that on occasion the shop also presents live musical performances. The Fortress Café (堡壘咖啡); ZhongShan Hall, 2nd Floor. At this Western-style restaurant, the prices can be quite high, with a set dinner from the rather limited menu easily costing NT$1,000-2,000. The lunch prices are somewhat more economical. The setting exudes old-style elegance. 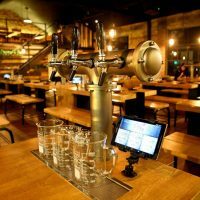 On request, the staff can take you through the restaurant to doors leading to an outdoor terrace. A plaque indicates the spot from which Chiang Kai-Shek delivered several of his major presidential speeches. From Zhongshan Hall we cross ZhongHua Road and go to Exit 6 of the Ximen MRT station. You are then facing several spokes that converge at the station. On this tour we’ll head first for places to eat, return and go left for a little history, and then proceed down ChengDu Street for some coffee. From the Ximen MRT, bear toward the right and go through the Ximending arch, which puts you on HanZhong Street, a pedestrian zone that bustles with shops and eateries. 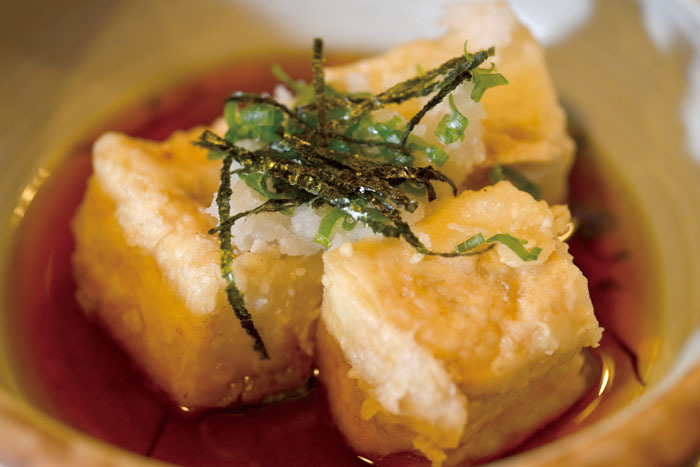 Take a right at EMei Street, the first intersection you’ll come to, for a quick meal or snack. Ay-Chung Flour-Rice Noodle (阿宗麵線); 8-1 EMei Street (峨眉街8之1號). This shop is easy to spot, as you’ll see lots of people standing, leaning, and sitting outside enjoying the popular main dish – rice vermicelli in a tasty broth. There is no indoor seating, so you’ll likely end up standing with everyone else. The dish is a relatively simple combination of broth, “glass noodles,” and a sprig of herb. You eat it with a spoon, which takes some practice. 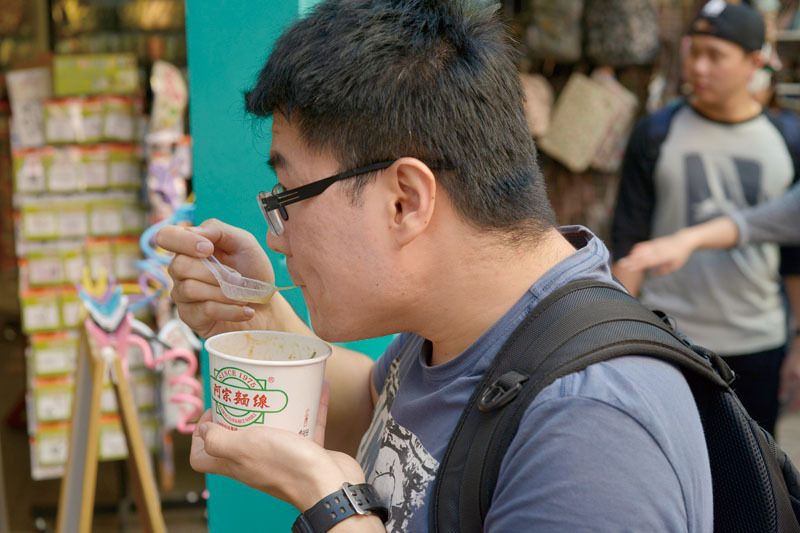 A large bowl costs only NT$65, but you may wish to opt for a small bowl if you think your arm might tire from holding the noodles while you eat. Pen Land Coffee Shop (半島咖啡); 144 ZhongHua Road, Sec. 1 (中華路一段144號). Just down the block from the noodle shop, stop here for a cool hazelnut milk tea that costs only NT$40. If space is available and you ask nicely and order a drink, you can probably bring in your bowl of noodles and sit down to finish them there. They may ask you to discard the disposable noodle bowl in the street-side trash container when you’ve finished. After downing the noodles, retrace your steps and continue on EMei Street in the opposite direction. 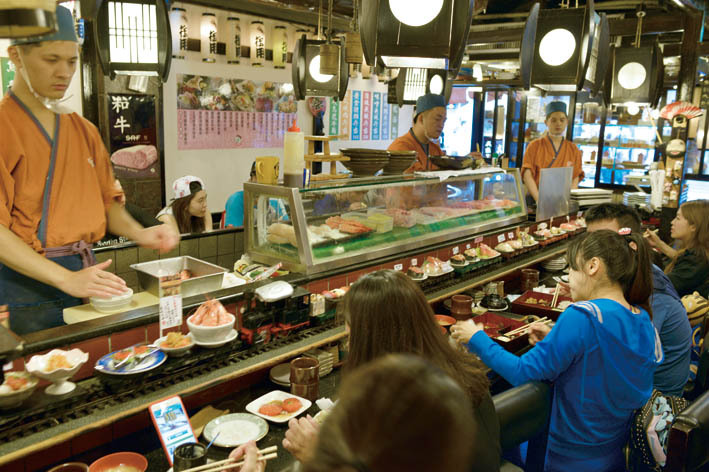 a popular Japanese restaurant with the added attraction of a model train that circles the center counter, delivering ordered items to patrons. Appropriately, Da Che Lun means “big wheel.” Order a Japanese-style lunchbox, which provides a main dish, rice, and side dishes, and supplement it with other options from the train. The total generally costs under NT$300. Now it’s time for a little dessert. Retrace your steps to HanZhong Street and take a left. Three Brothers and Sisters (三兄妹冰品店); 23 HanZhong Street (漢中街23號). As you walk down HanZhong Street from EMei, you’ll see lots of different eateries and snack shops. 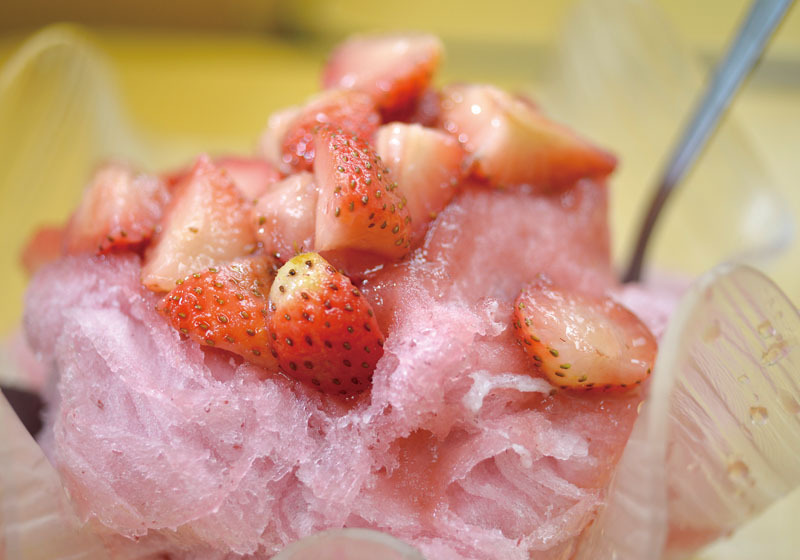 Shaved ice is one of the favorite Taiwanese desserts, and Bangka is overflowing with variations on this theme. One friendly and large shop that provides many options is Three Brothers and Sisters. We chose the strawberry version. It’s large enough for two people and costs only NT$120. With our belly full, we return down HanZhong Road to Ximen MRT Exit 6. As you face Ximending, in a plaza on your left is an attractive octagonal red brick structure – the Red House. The Red House (西門紅樓); 10 ChengDu Road (成都路10號). 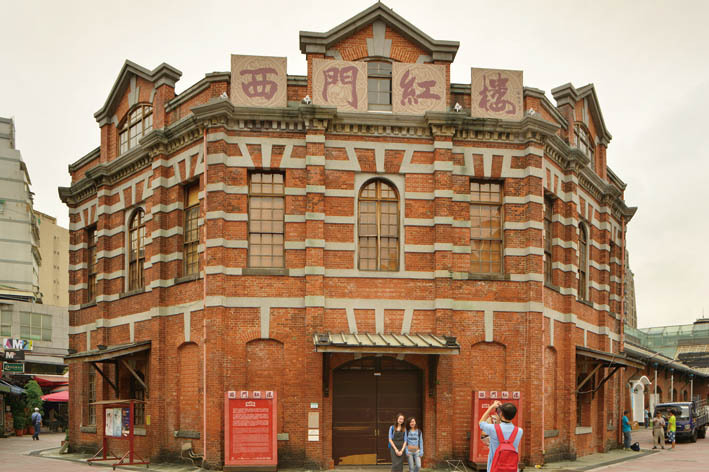 Built by the Japanese, the Red House was Taiwan’s first public market. Today it houses a theater on the second floor and a variety of exhibits, as well as a teahouse. The Red House is also the center of a vibrant youth and performance art culture that extends throughout the lively Ximending area. After reading the plaques to learn more of the history of Ximending and the Red House, it’s time for some refreshing coffee. If you head left on ChengDu Road from the Red House, the aroma of coffee will accompany you until you reach Fong Da Coffee (蜂大咖啡); 42 ChengDu Road (成都路42號). One of the oldest, best-known, and most popular coffee shops in Ximending, Fong Da was established in 1956. As you sit, surrounded by syphons and dripping coffee all around, the smells are heavenly. You can purchase a few tasty cookies and other treats at the entrance, and then take these into the store to enjoy with your coffee. Opposite Fong Da Coffee is one of the hidden jewels of Ximending, the Tianhou Temple (天后宮), located at 51 ChengDu Road (成都路51號). Although its entrance is rather small, the space and the temple suddenly seem to expand in all directions as you walk through the front gate. It’s now time to move southwest toward the Longshan Temple. Although you can return to the Ximen MRT and take it one stop to Longshan station, you’ll see more of Bangka if you walk to the Longshan area. Taking the latter option, we walk west down ChengDu Street from the coffee shop and then take a left onto KangDing Street. Bangka Qingshui Temple (艋舺清水巖); 81 KangDing Road (康定路81號). 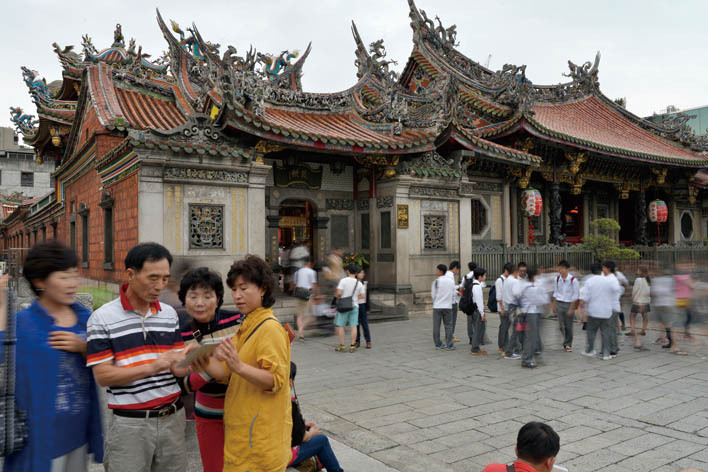 This historic temple – on KangDing Street between ChangSha Street and GuiYang Street – was originally built in 1787. Burned down in 1853 during the inter-clan “Ding-Xia Feud,” it was rebuilt in 1867, and the main hall has changed little since then. Set back a bit from the road, the temple offers a quiet place for contemplation. From the Qingshui Temple, go west on GuiYang Street. The street seems to age as one proceeds until it reaches another of Bangka’s beautiful and historic temples – the Qingshan Temple. Bangka Qingshan Temple (艋舺青山宮); 218 GuiYang Street, Sec. 2 (貴陽街二段218號). Established in 1856, this temple is larger than the Qingshui Temple, has a beautiful interior, and is attractively lit up at night. Continue west on GuiYang Street, and in about 50 meters you’ll arrive at the northern end of one of the most famous and infamous streets in Taiwan, HuaXi Street (aka Snake Alley). Take a left on HuaXi Street. This area was once a main tourist draw, featuring snake blood soup and a red-light district. It’s rather sanitized these days, and has lost some of its luster, but it still features a broad range of eateries. One of the best-known is Tainan Tan-tsu-mien (台南擔仔麵); 31 HuaXi Street (華西街31號). Established in 1958, this is a well-known seafood shop, but it’s not cheap, with a standard set course costing NT$1,900 per person. HuaXi Street empties into GuangZhou Street, which is also a night market. Take a left on GuangZhou Street to go to Longshan Temple. Before you arrive, you’ll see XiYuan Road, Sec. 1 (西園路一段), which hosts a large number of shops selling Buddhist items. Bangka Longshan Temple (艋舺龍山寺); 211 GuangZhou Street (廣州街211號). 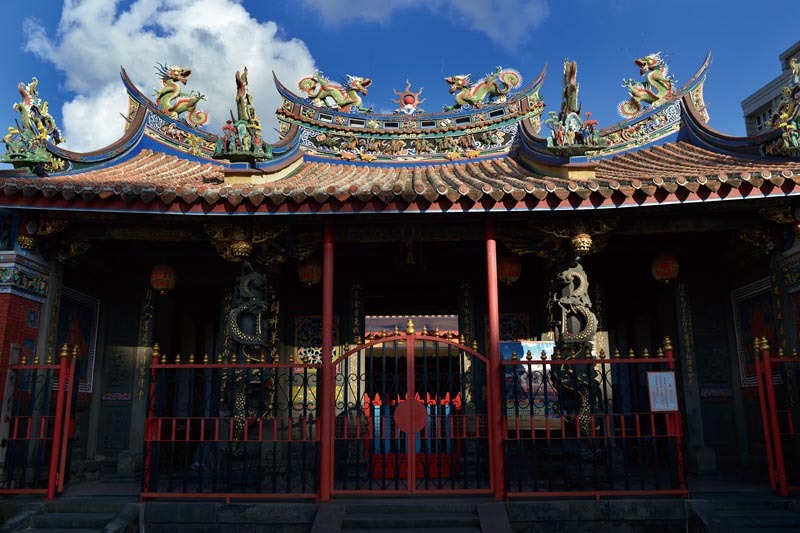 Built in 1738, this remains one of the most impressive and popular temples in Taiwan. It was rebuilt in the mid-1920s and was repaired again after a June 1945 bombing raid. The temple is often bustling with people, and provides a fascinating array of sights, sounds, and smells. Ji Yuan Vegetarian Eatery (吉緣素食); No. 15, Lane 109, HePing West Road, Sec. 3 (和平西路三段109巷15號). Try this simple and tasty restaurant near Longshan Temple. If you’re walking east on GuangZhou Street, go just past Longshan Temple and Lane 109 is on your right. It’s near Exit 1 of the Longshan MRT and across from Bangka Park (艋舺公園), which is just south of Longshan Temple. 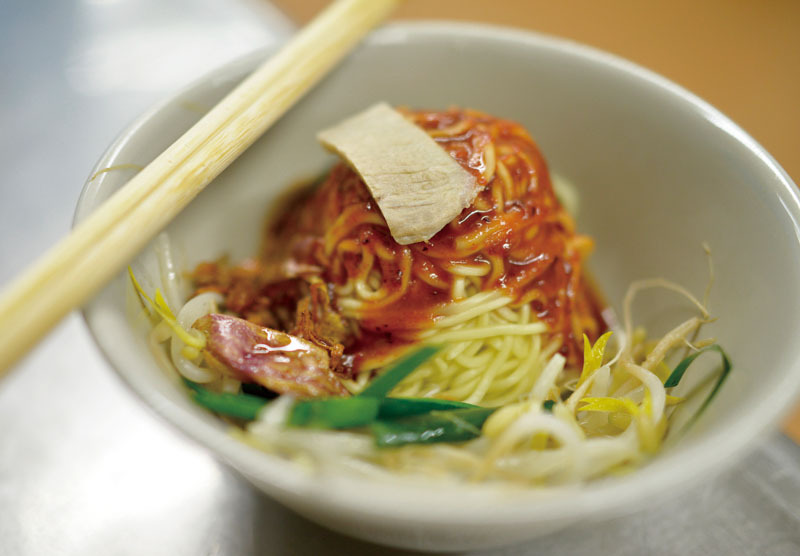 A bowl of assorted noodles (什錦麵) is a good starting point and includes lots of vegetables. To this you can add yummy side dishes. 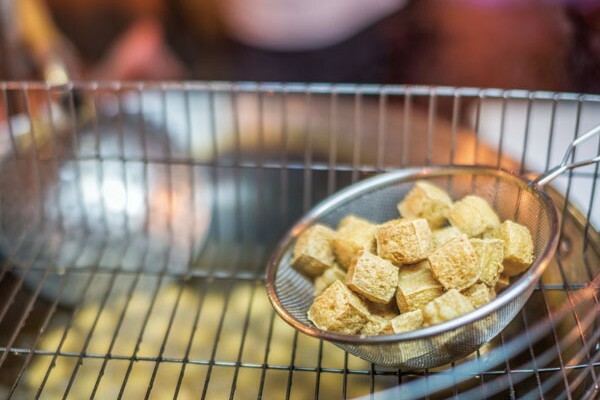 A meal of noodles, fried tofu, and sliced bamboo shoots costs just NT$105. It’s the vegetarian equivalent of “chicken soup for the soul.” Beverages can be brought in from outside. From the restaurant, go north on Lane 109 back toward GuangZhou Street. On the way, you’ll pass a Taiwanese-style snack shop on the corner of Lane 109 and SanShui Street (三水街). Continue down Lane 109 and then turn right for our last combination of sights and tastes. Bo-Pi Liao Historic District (剝皮寮歷史街區); 101 GuangZhou Street (廣州街101號). Located near the intersection of GuangZhou Street and KangDing Road, this area was originally developed during the Qing Dynasty and now consists of a large number of refurbished and rebuilt older buildings. It’s a pleasant atmosphere in which get a sense of old Taipei. A-Xiu Traditional Taiwanese Noodles (阿秀傳統切仔麵店); 90 GuangZhou Street (廣州街90號). 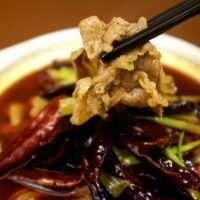 This tasty old-style Taiwanese noodle restaurant is across the street from Bo-Pi Liao. 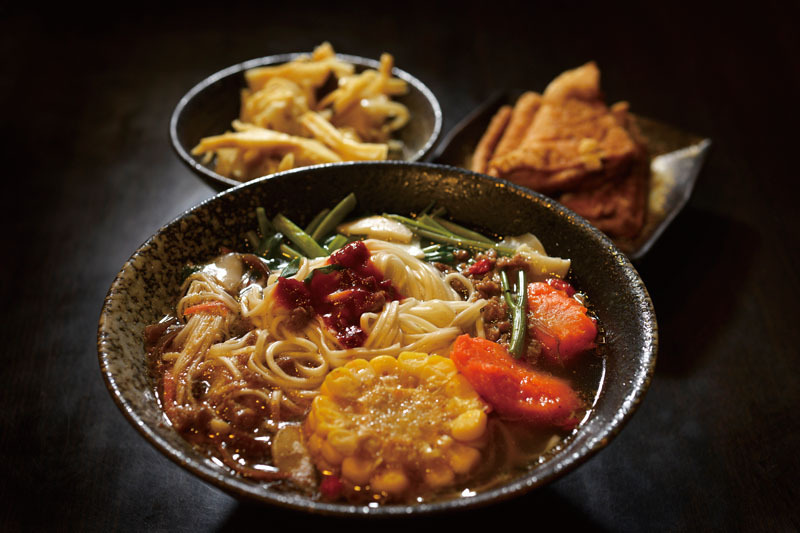 As the name implies, the specialty of the house is small bowls of noodles with a little broth, as well as good side dishes. A serving of noodles costs only NT$30. Jin Cai Qie-Zai Mian (Noodles) (進財切仔麵); 96 GuangZhou Street (廣州街96號). This traditional-style Taiwanese eatery is just across the lane from the A-Xiu Noodle shop. As shown on the wall, the shop’s history goes back to 1896 (although not all in the current location). The friendly staff can offer an English menu, with Tainan Yi Mien (台南意麵) as the main dish. It consists of rather flat noodles, with small pieces of meat in a nice broth. You can have it as a soup or dry. 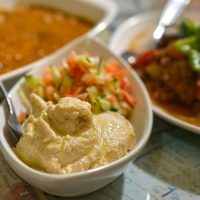 Everything is lightly flavored, and should help put you in a peaceful mood. This is good, simple food in the heart of historic Bangka. With that, you’ve captured much (but of course not all) of the interesting tastes and sites of Bangka. 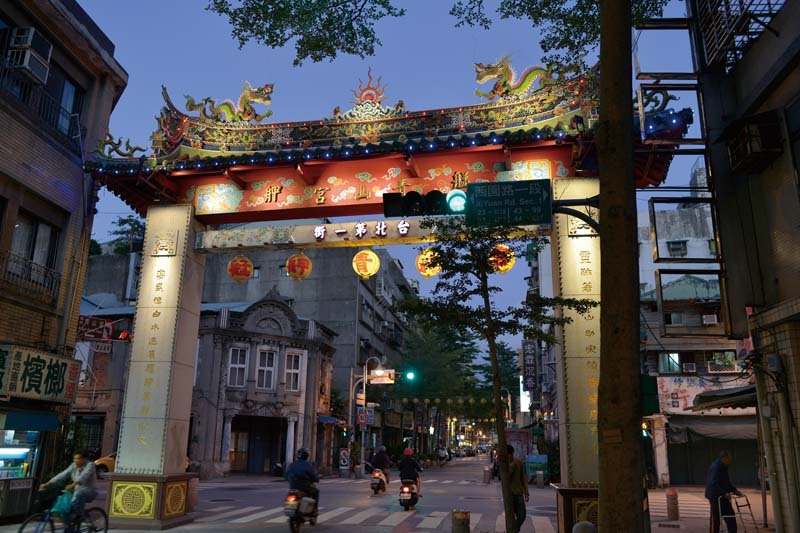 This district offers a fascinating combination of old and new, venerable tradition with youthful energy, all mixed together on the site of a small settlement that eventually grew into the Taipei City we know today. 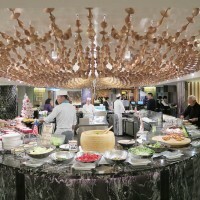 This entry was posted in Wine & Dine and tagged cuisine, culture, Food, Taipei, travel. Bookmark the permalink. Scott Weaver, a longtime resident of Taipei, is a Contributing Writer for Taiwan Business TOPICS.